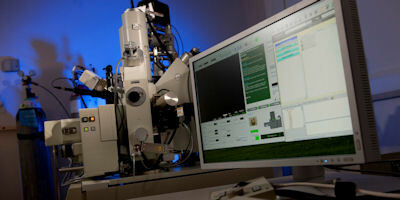 Overview: Leading UK facility for imaging and microanalysis of solid materials at the micron scale. This facility is part of the Leeds Electron Microscopy and Spectroscopy Centre. FEI QUANTA 650 FEG Scanning Electron Microscope (SEM) with Oxford Instruments X-Max 80 EDS detector, Nordlys S EBSD camera and Aztec Synergy Software. Also KE panchromatic CL detector. Tescan VEGA3 XM Scanning Electron Microscope (SEM) with colour filtered CL system, also Oxford Instruments X-max 150 EDS detector with Aztec energy software – includes “Feature” software for automated particle counting and analysis. Also Alicona MEX 3D software for 3D imaging and metrology of surface roughness. Large chamber and large sample carousels for high throughput of multiple samples. JEOL JXA8230 Electron Probe Microanalyser (EPMA) with 1x EDS and 5 x WDS spectrometers. Equipped with “Probe for EPMA” advanced microanalytical software. We are committed to sharing our facilities and associated expertise with external academic and industrial collaborators. To make an enquiry please contact Dr Richard Walshaw, e: r.d.walshaw@leeds.ac.uk.